What's the Difference Between Hash Browns and Home Fries? — What's the Difference? What's the Difference Between Hash Browns and Home Fries? Remember that whole kingdom/phylum/class/order taxonomy you learned in ninth-grade biology? If you applied that very scientific framework to something like, say, fried potatoes, breakfast potatoes would be a genus, and home friesand hash browns would be the major species. Let's start with hash browns. According to Merriam Webster, hash browns consist of “boiled potatoes that have been diced or shredded, mixed with chopped onions and shortening, and fried usually until they form a browned cake.” For the sake of real-world application, we’ll expand this definition: hash browns are made from potatoes that have usually been par-cooked in some way, whether it’s boiling, steaming, or microwaving; mixed with any additional ingredients to form a homogenous mixture; and fried in some sort of fat into a crisp, golden cake/patty/structure/squashed-looking thing with frazzled edges. It can be shaped or shapeless, medusa-like or tidy, but the key is its shredded-but-still-held-together-ness. Home fries, on the other hand, are simply “potatoes that have usually been parboiled, sliced, and then fried.” What’s key about home fries is that the pieces of potato—whether they’re sliced into half-moons or diced into cubes—are distinct from one another. Those potatoes are usually fried in a shallow pan or skillet—as opposed to a deep fryer—and are sometimes cooked with sliced onions and/or peppers. In summary: home fries consist of pieces of potato, while hash browns are a coherent mass of shredded potato. With home fries, any mix-ins (onions, peppers, etc.) would retain their individuality, whereas in hash browns, the mix-ins would be incorporated into the shredded-potato mix. While we’re here, let’s explore some fun fried-potato facts, shall we? Waffle House serves 238 hash brown orders a minute. According to the book Menu Mystique, the first recipe for rosti—the shredded-potato cake thought to be the predecessor to hash browns—was found in Switzerland in 1598. French fries first appeared in America in 1802, when Thomas Jefferson, the president at the time, had the White House chef serve “potatoes in the French style” (namely “potatoes deep-fried while raw, in small cuttings”) at a state dinner. 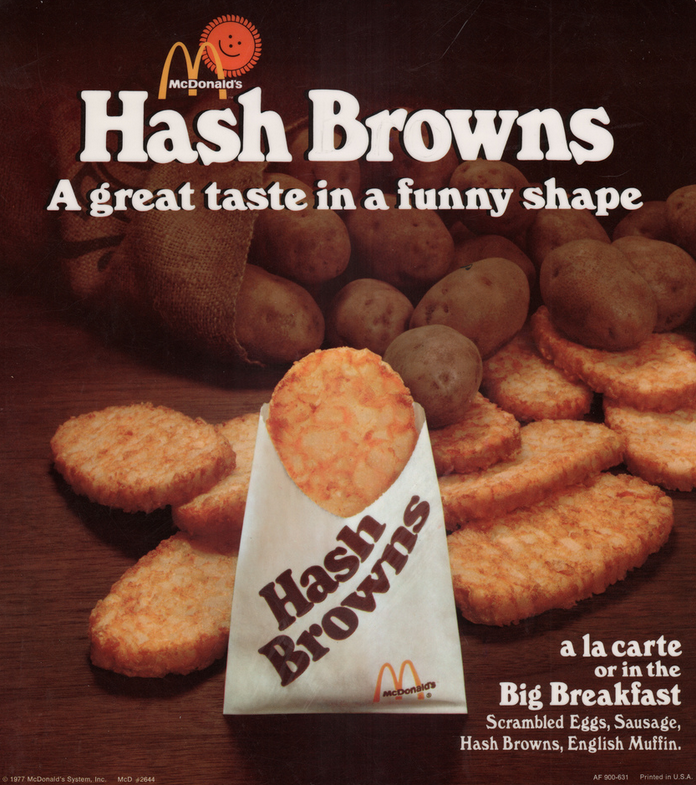 When McDonalds introduced their hash browns to the breakfast menu in 1977, their advertising read: “Hash Browns: A great taste in a funny shape.” Crazy to think that the shape of McDonalds hash browns—that flat, perfect, potato-shaped oval—was novel at the time.